A collapsing sidewalk had one resident asking Executive Committee for a new one. The request was denied; but when he left, he didn't leave angry, just disappointed and cracking jokes. Caribou Street West resident Ray Christmann came to Executive Committee, asking them to replace the sidewalk in front of his home because it had sunken and water had begun pooling there. With the real potential for water to now run into his house and cause problems with his basement, he felt in the appropriate time to take the concern to a higher authority. Additionally, he pointed out some safety concerns regarding the fallen and cracked pavement. In his written submission, Christmann pointed out "if (sic) sidewalk was fixed then hole on street could be fixed and water could run east." He provided photographic evidence of water pooling and potentially flooding into his yard and basement. Despite his presentation, the committee had no questions for the property owner. Councillor Brian Swanson explained that Council could do nothing to help the concerned taxpayer. 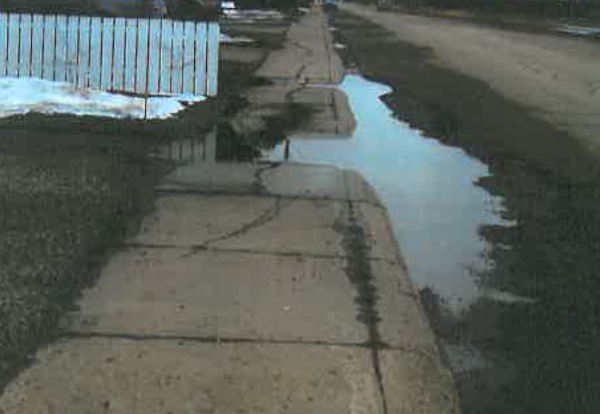 "The point in the report is it is not up to us to tell Administration to go and fix this sidewalk and that sidewalk and that would be interference," Coun Swanson told the disappointed homeowner. "This is a very serious thing; we have a rut in front of our house," Christmann replied. "There is a budget set and once that money is gone that's it," Coun Swanson replied adding "I know if persistence was the point." "Do I have to come back next year to complain or make it earlier?" Christmann quipped back drawing a few chuckles. Councillor Scott McMann then asked "when water is pooling is this moving up (in priority)?" City Engineer Josh Mickelborough replied that Christmann's sidewalk was not in bad enough shape to be on the immediate replacement list. "The unfortunate reality is this type of slumping is common over service connections," Mickelborough stated, adding, though the lateral crack would be addressed, likely with cement grinding. With only $400,000 to $500,000 for sidewalk replacement budgeted for, there is only money to address safety issues which might cause residents to be injured, he stated. Earlier in the discussion, Christmann had made a joke hinting that the rules could be bent to get his sidewalk replaced. Coun McMann then asked if Christmann's concerns would be followed up on later. Mickelborough stated that the concern was being tracked and would next year be part of the review of what sidewalks to replace on a priority basis. As he was leaving, the jovial Christmann was told by Coun Swanson, with present funding, sidewalks were being replaced at over 200 years but in the past it was over 300 years "so things are getting better." Christmann shook his head and laughed as he left the committee room.